Chrissy Teigen's mom is officially a United States citizen, and she couldn't have done it without toddler Luna by her side. Vilailuck Teigen, who lives with her daughter and son-in-law John Legend, passed her citizenship test on Wednesday and was all smiles as she and Luna said the Pledge of Allegiance. Chrissy Teigen shared an adorable video of her mom's life-changing accomplishment in which Luna placed her hand over her heart and proudly waved (OK, chewed on) a small American flag. "YES MOM!! Congrats @pepperthai2," Chrissy tweeted. Legend also celebrated the news, bragging that his mother-in-law scored a perfect "100% on her test." 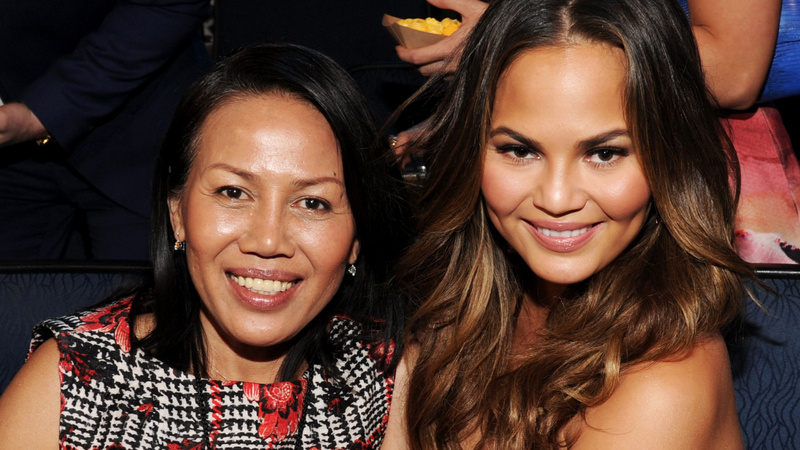 Chrissy Teigen and her family have every reason to feel proud. According to Insider, test-takers have to answer 10 questions randomly selected from a pool of 100 and get at least six answers correct to pass. The questions are focused on civics and U.S. government and can range from "Who is the current president?" to "Name one war fought by the United States in the 1800s." This week has also been huge for Teigen, model and author of the cookbook Cravings: Hungry for More, as she launched a clothing collaboration with Revolve and a cozy, food-themed makeup collaboration with cosmetics company Becca. She also recently nabbed a Vogue spread with her kids, Miles and Luna, and she and her EGOT-winning hubby still made time to vote early in the midterm elections. As if this couple couldn't get any busier, Teigen revealed to People in September that she'd like to fill her home with even more kids in the future. "John wants however many kids I want. That's the good thing with John — he is down for it," she told the magazine. "Are we ready right now? No! I really love having two, but I think when I'm 70, I'll look back and say, 'Oh, I wish I had more.' I can't see myself regretting having a ton of kids." If they're all as sweet and supportive as Luna proved to be during her grandma's big day, the world would be lucky to have more little Teigens running around!